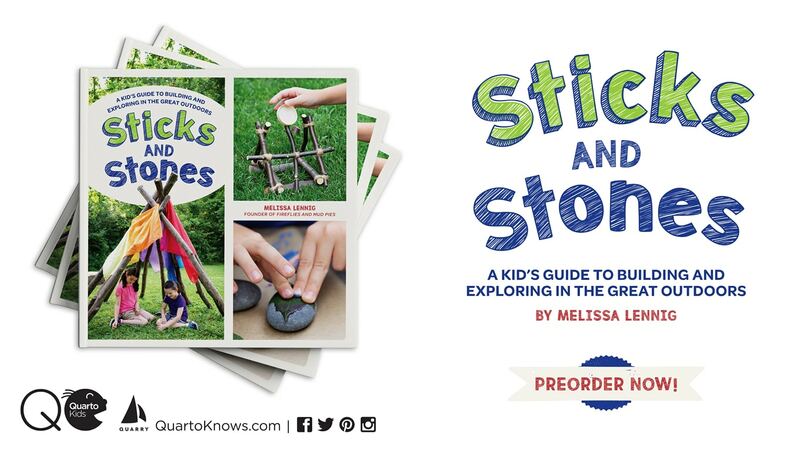 By Melissa Lennig on May 18, 2014 13 Comments. This content contains affiliate links. As an Amazon Associate I earn from qualifying purchases. My oldest son recently visited the local recycling center with his Kindergarten class. He came home filled with knowledge—a little eco-Yoda—ready to pick-up litter, sort trash, and save recyclables from a dismal eternity in the landfill! When he asked if paper could be recycled at home, I skipped back to my Outdoor Educator years at camp and pulled up my sleeves! Shared below is a tutorial for creating boutique-worthy plantable Recycled Paper Seed Cards at home with kids. 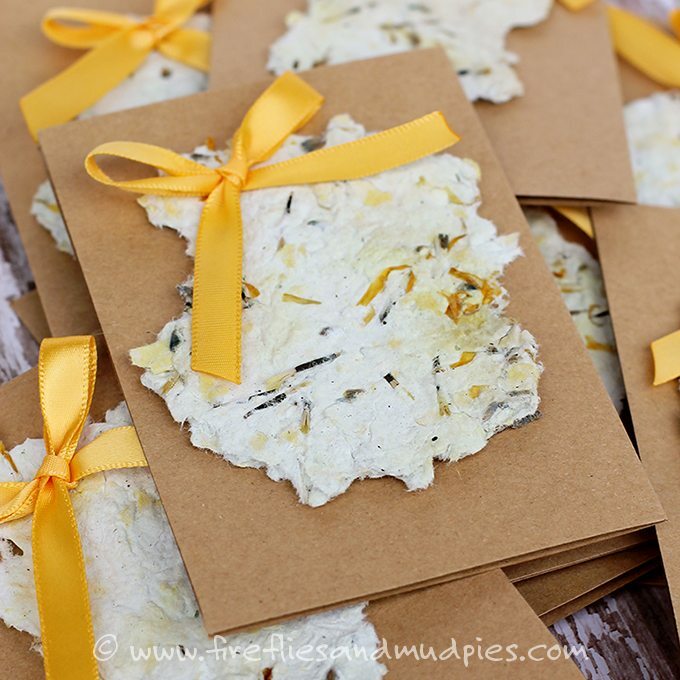 Recipients of our homemade cards can remove the white paper, plant it, and enjoy the marigolds that will grow. Recycling paper at home is an easy activity for children, and the pulp is a mushy, cool sensory experience in itself! Cookie sheets, or just do this craft outside on the grass! 1. 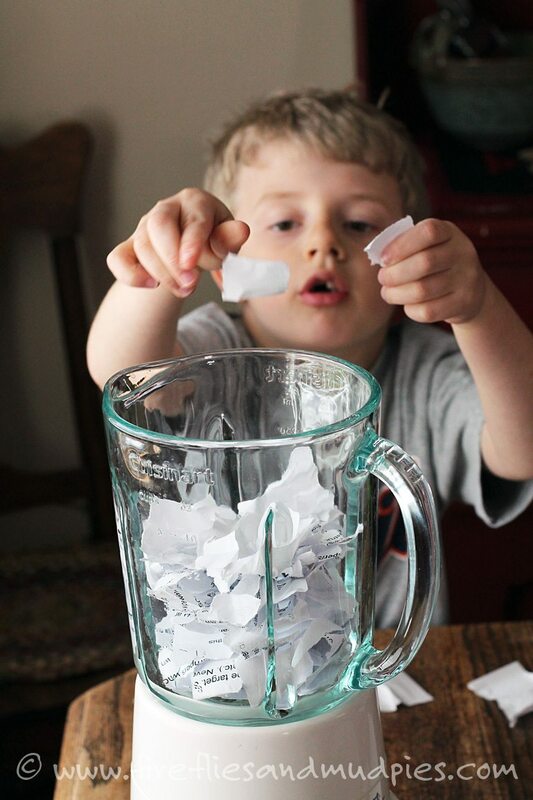 Invite your child to tear the scrap paper and place it into the blender. When the blender is full of paper, turn on and add just enough water to create a grey, mushy pulp. 2. Place squares of cheesecloth into the embroidery hoop. Tighten the hoop so the fabric is taut. Place the hoop onto a cookie sheet. 3. Dump the paper pulp into a large bowl. Add enough water to create a thin, pulpy liquid. 4. 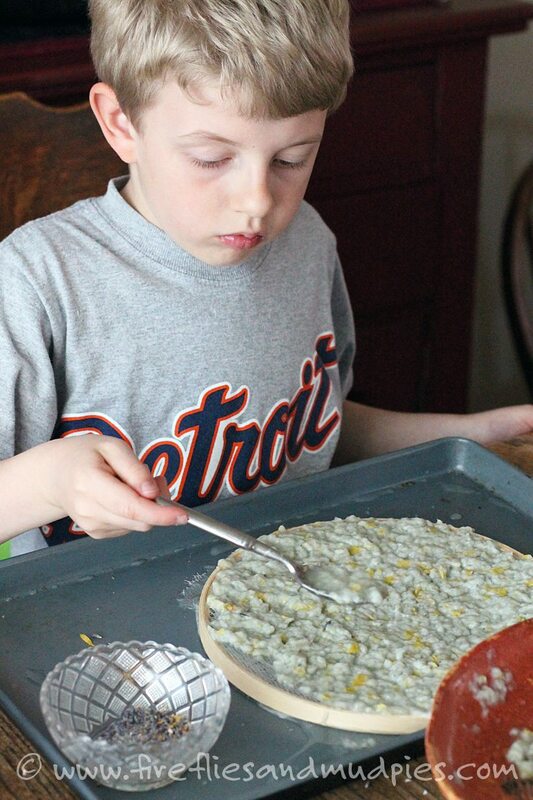 Show your child how to scoop pulp from the bowl and spread it onto the cheesecloth. Using the back of a spoon or his fingertips, invite him to press down on the pulp to squeeze the excess liquid through the cheesecloth. Add seeds and flower petals, being sure to spread a thin layer of liquid pulp on top of them. 5. Allow the paper to dry completely in the sun. When it is dry, gently peel the paper off the cheesecloth. Tear the paper into the size needed for your cards. Recycled Paper Seeds Cards are perfect for any occasion! I love that my children experienced recycling firsthand and created something beautiful to share with their loved ones.